Christopher Donohue and ensemble. Photo courtesy Jenny Graham and the Oregon Shakespeare Festival. 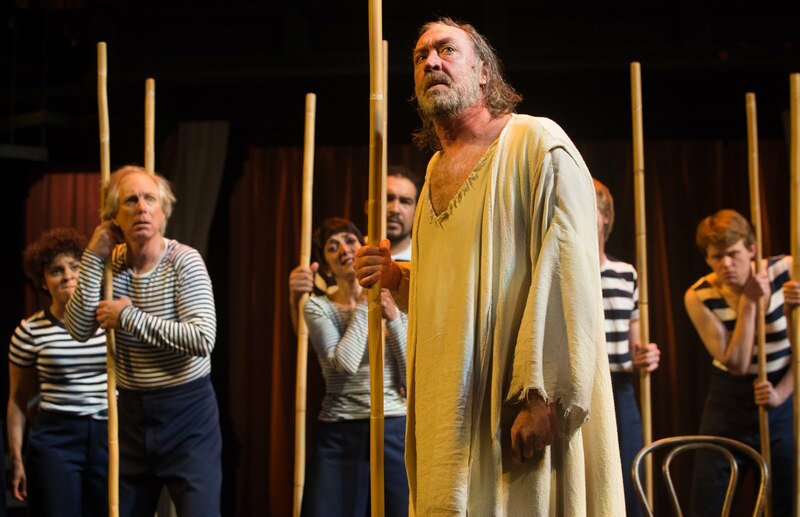 Theatregoers familiar with the oeuvre of writer/director Mary Zimmerman may have some idea of what to expect from OSF’s The Odyssey. The play features the grand plotlines and imaginative effects that have become a hallmark of Zimmerman’s mythological adaptations. While most of Zimmerman’s previous productions have remained reasonably faithful to the setting and time period of the original myth, The Odyssey uses numerous anachronistic elements. Much of this results from Mara Blumenfeld’s costume design: Alcinous (Armando McClain) and the members of his coastal kingdom, for example, are dressed in 1910s sailor outfits with straw boaters, while lord of the winds Aeolus (Armando Durán) resembles a mad scientist from a children’s show. Occasionally, extra meaning is added through these changes, such as the feminist themes in the Siren section. These changes and additions don’t create a new myth as much as they interpret the old one differently: The Odyssey is a living story, born from oral tradition, that exists to be readapted. Many of the fantastical elements of the play are relayed through theatrical metaphor. To express the titanic size of the cyclops Polyphemus (Daniel T. Parker), for example, Zimmerman projects a giant shadow on a curtain and uses toy boats and dolls to represent Odysseus’ hapless crew. These effects make use of the audience’s suspension of disbelief to provide an imaginative experience that something more realistic wouldn’t achieve. The fight between Odysseus and Penelope’s suitors at the end of the play, in particular, is a breathtaking work of visual poetry. The play is primarily an ensemble piece, with actors playing multiple characters over its course. Thus, it’s difficult to discuss the work of one particular actor playing one particular role. A few exceptions exist, including Athena (Christiana Clark) and Odysseus (Christopher Donahue). Clark’s Athena isn’t as stern as other portrayals of the war goddess, instead urging Odysseus to go forward with positivity and energy. Her silent presence over the play adds new layers of meaning and insight into the Ancient Greek views of destiny and divine favor. Donahue provides an excellent contrast: He mutes Odysseus’ famous cleverness with a veil of frustration and helplessness. The pain of having home snatched from under him over and over has worn Odysseus down: He just wants to be in Ithaca now. Other standout characters include Kate Hurster as Penelope, Odysseus’ long-suffering wife, and Benjamin Bonenfant as Telemachus, their son. Their struggles against Penelope’s suitors begin the play, and not only set the stakes for Odysseus’ long journey but provide a more human context for the events of the epic poem. Hurster adds a dash of mischievous glee to her Penelope, as her multiple deceptions bring her not only safety but also satisfaction; meanwhile, Bonenfant’s Telemachus is prideful and deadly serious, attempting to resolve the situation directly even though he knows he’s outclassed. The Odyssey is one of Western civilization’s oldest stories, one whose structure continues to resonate even today. Zimmerman’s use of anachronism calls this to attention, implying that even though we don’t live in Ancient Greece or worship Athena, there is something essential at the core of the work that still speaks to something deep witin us. The Odyssey runs until October 14th.